"It's available in two neutral colors (slate gray and silver gray), and the finish is mildew resistant and super long-lasting." "This high-performance coating can lock down splinters and restore old wood. It also provides a slip-resistant finish." "Put a pop of color and a life-extending coat on old wood structures. It can rub out those annoying splinters and cracks up to a quarter inch." "Specially-formulated non-skid additive works well on most outdoor areas, including concrete, wooden decks, and pavers." "To show off good-looking wood, gravitate to semi-solid, transparent and semi-transparent." "Shows off the natural beauty of a wood deck while also adding a tint or enhancing the already vibrant hue of the durable redwood deck planks." "This water-based stain is fortified with zinc nano-particle technology to protect your deck from the sun's harmful rays." "This non-stick and inexpensive deck paint will give you a unique finish that definitely holds up over time." "Comes in five colors from a blue hue that can bring a relaxing tone...to a shady emerald that will complement the foliage in your backyard." "Only need one coat of this creamy white primer to cover any flaws in your wood. It's quick drying and has low odor due to the low VOC." A good deck paint should be long-lasting, easy to maintain, and durable. This latex floor paint from KILZ checks all of those boxes and more! The KILZ floor coating has a low-lustre finish that is perfect for painting your deck, porch, or patio. It's available in two neutral colors (slate gray and silver gray), and the finish is mildew resistant and super long-lasting. One gallon of this paint covers 200-300 square feet on rough surfaces and 300-400 square feet on smooth surfaces. Reviewers say that this paint has a gorgeous finish and works great for sealing out stains. They also noted that the two color options are even nicer in person. If you plan to paint your deck a nontraditional color to add some flair to your outdoor space, consider this colored paint by Olympic Resurfacer. This high-performance coating can lock down splinters and restore old wood. 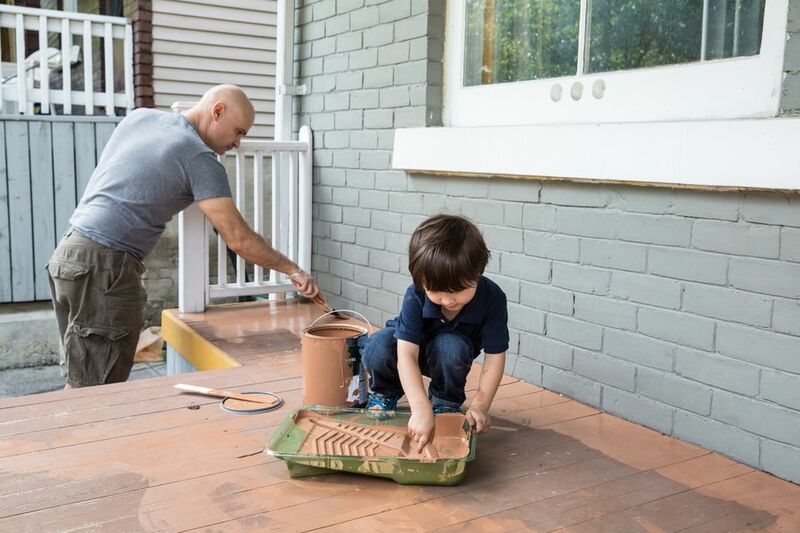 It also provides a slip-resistant finish, so if you have kiddos that might be running around on your deck the resistant finish will be a huge bonus. You can also use Olympic Resurfacer to paint a design on your deck floor, such as a checkerboard design or colorful stripes. Once you lay out the pattern and outline it with painter’s tape, roll down a layer of this paint to create a long-lasting piece of art in your backyard. Olympic Resurfacer comes in stains as well as thick paints so you can pick the best option for your project. The worn wood on decks may provide you with a rustic look, but it isn’t doing the wood any favors. When it’s time to repaint old wood to give it new vitality, Behr Premium Deckover can put a pop of color and a life-extending coat on old wood structures. It can rub out those annoying splinters and cracks up to a quarter inch to keep the wood deck sure and plumb for years to come. It comes in smooth, textured (for a stippled look), or extra textured to offer a slip-resistant surface up to 75 square feet and two coats. For those with in-ground or above-ground pools, or a tribe of family and friends that enjoy a good slip and slide, this non-slip coating is a keeper. It covers 100 to 125 square feet with just one coat per gallon. The specially-formulated non-skid additive works well on most outdoor areas, including concrete, wooden decks, and pavers. Whether it is an old or newly built structure, a deck that sees a lot of wet foot traffic will benefit from a coat of In the Swim every few years to keep the slips and falls to a minimum. If you plan to put a coat down on a wooden deck, make sure to use an oil-based primer for best results. Every wood has its own personality and color that can shine under the right deck paint. To show off good-looking wood, gravitate to semi-solid, transparent and semi-transparent. These options give the wood an opportunity to show of its best features at any time of day. Penetrating deck stains and paint soak into the wood grain and makes the deck easier to maintain. To see what moves you, try different colors on inconspicuous spaces on your deck before you commit. Staining a deck can be a big job so choose your color carefully so that you won’t have any buyer’s remorse once that first coat has set. Sherwin-Williams Super Deck shows off the natural beauty of a wood deck while also adding a tint or enhancing the already vibrant hue of the durable redwood deck planks. When choosing from Sherwin-Williams’ line of Super Deck paints, stains and tints, consider the exterior of the home, the surrounding landscape and any major pieces that will be sitting on the deck once it is complete. Treated wood may seem impervious to the seasons and unforgiving weather, but even the sturdiest decks may splinter and crack over time. We recommend using Defy Extreme Wood Stain, which is a semi-transparent water-based product that works well with treated wood decks. This water-based stain is fortified with zinc nano-particle technology to protect your deck from the sun's harmful rays. The resins in the wood stain hold up to fading and won’t darken and discolor as the sun beats down on the deck, season after season. It can also add shine to old and dull wood. Bring a hint of texture to your outdoor space with a bright coat of color and texture that will go with anything you have on deck. From tiny feet traipsing over the boards to tons of furniture and grilling equipment meant to be moved around, this non-stick and inexpensive deck paint will give you a unique finish that definitely holds up over time. Reviewers love that it has a fast drying time to get the deck ready quickly for big events that will have a lot of foot traffic. The RTG Deck, Porch, Patio Anti-Slip Paint is a one-coat wonder that comes in a variety of neutral colors that will make the deck stand out against a lush, vibrant landscape. Anvil Deck-A-New Resurfacer Paint lays down an acrylic non-slip surface that will allow you and your guests to enjoy your deck season after season. It can repair otherwise structurally sound decks by filling in cumbersome cracks and swiping away splinters. Each gallon of the deck paint polishes off up to 160 square feet for a clean and primed surface. It comes in a five colors, from a blue hue that can bring a relaxing tone to your outdoor area to a shady emerald that will complement the foliage in your backyard. When the wood looks like it needs more TLC than you are capable of, a primer can fix all the dings, dents and splintered banisters that make you cringe. Lay down a coat of Benjamin Moore Fresh Start Exterior Wood Primer to create a smooth surface before you paint over it with a heavier deck paint. You should only need one coat of this creamy white primer to cover any flaws in your wood. It's quick drying and has low odor due to the low VOC.